I tend to focus on food on this blog but the wider context is consumerism and gaining awareness of how our products get to market, and how people and land are impacted for good and for ill on that journey. My assumption is that the current consumer system of commodities not only doesn't go out of its way to help us know the details, but it intentionally hides its tracks in a veneer of shiny happy people in stock photos and focus-grouped narratives that resonate. That was certainly one of the big lessons from our year-long experiment. I'll never forget the guy at the ADM flour mill in 2008 explaining that Bob's Red Mill, a premium brand "stone-ground" flour, was milled with all the other flour that is packaged as Gold Seal, Western Family or every other brand in the grocery store, but after being milled, it was shipped to Portland to be unnecessarily run through their stone grinders so they could label it as "stone-ground." I'm not sure if they still do that, but I'm pretty sure they don't want consumers to know that part of story of their product. The passing of Steve Jobs last week combined with the amazing current success of Apple has created a firestorm or adoration and accolades that I have been as much a part of as anyone. I'm typing this on my Macbook Pro which is charging my IPhone and I have rejoiced in recent months in my experience with Mac Mail and my freedom from Microsoft Outlook. After a week of adoring Steve Jobs and his advice to make the most of life, my attention today has turned to the Apple supply chain and the thousands of primarily Chinese low-income workers who have literally built the Apple empire. I'm struck this morning by the meaninglessness of Jobs' advice to the majority of the people who have worked to build Apple products all these years. If Jobs had delivered his Stanford commencement address to the morning work shift at one of Apple's factories in Taiwan, Singapore, the Philippines, Malaysia, Thailand, or Czech Republic, how would they have responded? What kind of sense would it make in their lives to hear the advice, "Dont' settle." I have a hunch that the advice to "stay hungry" would be confusing to people who were familiar with a very different kind of hunger than the metaphorical variety Jobs was promoting. With the complex at peak production, operating 24 hours a day, seven days a week to meet the global demand for Apple phones and computers, a typical day begins with the Chinese national anthem being played over loudspeakers, with the words: 'Arise, arise, arise, millions of hearts with one mind. 'As part of this Orwellian control, the public address system constantly relays propaganda, such as how many products have been made; how a new basketball court has been built for the workers; and why workers should 'value efficiency every minute, every second'.With other company slogans painted on workshop walls – including exhortations to 'achieve goals unless the sun no longer rises' and to 'gather all of the elite and Foxconn will get stronger and stronger' – the employees work up to 15-hour shifts. 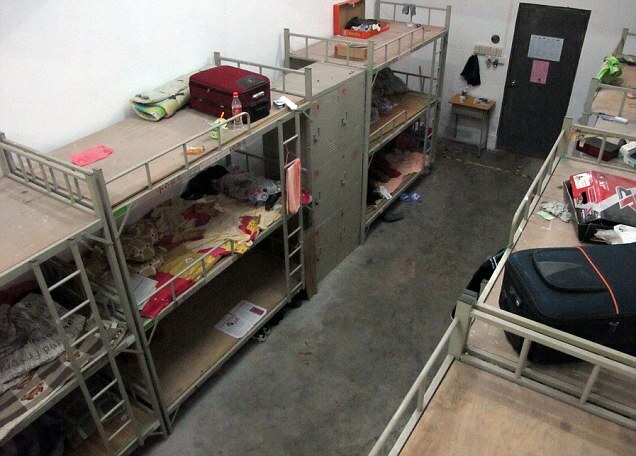 Down narrow, prison-like corridors, they sleep in cramped rooms in triple-decked bunk beds to save space, with simple bamboo mats for mattresses. Despite summer temperatures hitting 35 degrees, with 90 per cent humidity, there is no air-conditioning. Workers say some dormitories house more than 40 people and are infested with ants and cockroaches, with the noise and stench making it difficult to sleep. See picture above for a sense of the dorm-like accommodations. Apple admitted at the time that there were children as young as 15 years old working at some of its factories. Remembering that I'll be dead soon is the most important tool I've ever encountered to help me make the big choices in life. Because almost everything — all external expectations, all pride, all fear of embarrassment or failure – these things just fall away in the face of death, leaving only what is truly important. That's advice that I can live with and advice that would resonate even on the Apple factory floor.